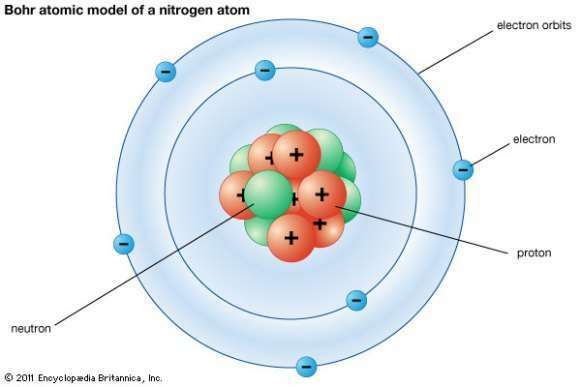 Our current model of the atom can be broken down into three constituents parts – protons, neutron, and electrons. Each of these parts has an associated charge, with protons carrying a positive charge, electrons having a negative charge, and neutrons possessing no net charge. In accordance with the Standard Model of particle physics, protons and neutrons make up the nucleus of the atom, while electrons orbit it in a "cloud". The electrons in an atom are attracted to the protons in the nucleus by the electromagnetic force. Electrons can escape from their orbit, but only in response to an external source of energy being applied. The closer orbit of the electron to the nucleus, the greater the attractive force; hence, the stronger the external force needed to cause an electron to escape. Electrons orbit the nucleus in multiple orbits, each of which corresponds to a particular energy level of the electron. The electron can change its state to a higher energy level by absorbing a photon with sufficient energy to boost it into the new quantum state. Likewise, an electron in a higher energy state can drop to a lower energy state while radiating the excess energy as a photon. Atoms are electrically neutral if they have an equal number of protons and electrons. Atoms that have either a deficit or a surplus of electrons are called ions. Electrons that are farthest from the nucleus may be transferred to other nearby atoms or shared between atoms. By this mechanism, atoms are able to bond into molecules and other types of chemical compounds. All three of these subatomic particles are Fermions, a class of particle associated with matter that is either elementary (electrons) or composite (protons and neutrons) in nature. This means that electrons have no known internal structure, whereas protons and neutrons are made up of other subatomic particles. called quarks. There are two types of quarks in atoms, which have a fractional electric charge. 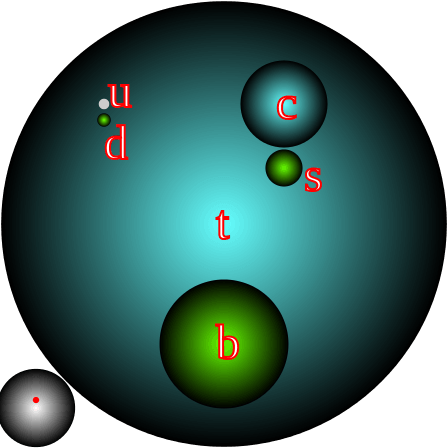 Protons are composed of two "up" quarks (each with a charge of +2/3) and one "down" quark (-1/3), while neutrons consist of one up quark and two down quarks. This distinction accounts for the difference in charge between the two particles, which works out to a charge of +1 and 0 respectively, while electrons have a charge of -1. Other subatomic particles include Leptons, which combine with Fermions to form the building blocks of matter. 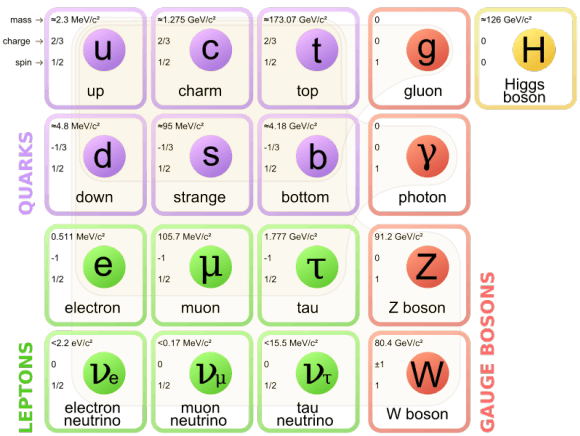 There are six leptons in the present atomic model: the electron, muon, and tau particles, and their associated neutrinos. The different varieties of the Lepton particles, commonly called "flavors", are differentiated by their sizes and charges, which effects the level of their electromagnetic interactions. Then, there are Gauge Bosons, which are known as "force carriers" since they mediate physical forces. For instance, gluons are responsible for the strong nuclear force that holds quarks together while W and Z bosons (still hypothetical) are believed to be responsible for the weak nuclear force behind electromagnetism. Photons are the elementary particle that makes up light, while the Higgs Boson is responsible for giving the W and Z bosons their mass. The majority of an atoms' mass comes from the protons and neutrons that make up its nucleus. Electrons are the least massive of an atom's constituent particles, with a mass of 9.11 x 10-31 kg and a size too small to be measured by current techniques. Protons have a mass that is 1,836 times that of the electron, at 1.6726×10-27 kg, while neutrons are the most massive of the three, at 1.6929×10-27 kg (1,839 times the mass of the electron). The total number of protons and neutrons in an atoms' nucleus (called "nucleons") is called the mass number. For example, the element Carbon-12 is so-named because it has a mass number of 12 – derived from its 12 nucleons (six protons and six neutrons). However, elements are also arranged based on their atomic numbers, which is the same as the number of protons found in the nucleus. In this case, Carbon has an atomic number of 6. 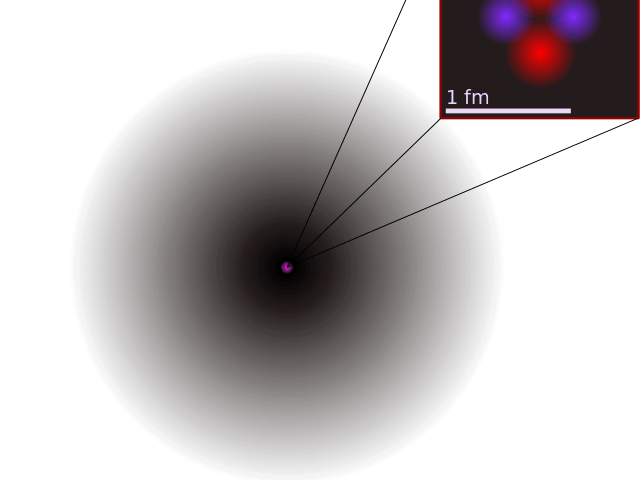 The actual mass of an atom at rest is very difficult to measure, as even the most massive of atoms are too light to express in conventional units. As such, scientists often use the unified atomic mass unit (u) – also called dalton (Da) – which is defined as a twelfth of the mass of a free neutral atom of carbon-12, which is approximately 1.66×10-27 kg. Chemists also use moles, a unit defined as one mole of any element always having the same number of atoms (about 6.022×1023). This number was chosen so that if an element has an atomic mass of 1 u, a mole of atoms of that element has a mass close to one gram. Because of the definition of the unified atomic mass unit, each carbon-12 atom has an atomic mass of exactly 12 u, and so a mole of carbon-12 atoms weighs exactly 0.012 kg. Any two atoms that have the same number of protons belong to the same chemical element. But atoms with an equal number of protons can have a different number of neutrons, which are defined as being different isotopes of the same element. These isotopes are often unstable, and all those with an atomic number greater than 82 are known to be radioactive. When an element undergoes decay, its nucleus loses energy by emitting radiation – which can consist of alpha particles (helium atoms), beta particles (positrons), gamma rays (high-frequency electromagnetic energy) and conversion electrons. The rate at which an unstable element decays is known as its "half-life", which is the amount of time required for the element to fall to half its initial value. The stability of an isotope is affected by the ratio of protons to neutrons. Of the 339 different types of elements that occur naturally on Earth, 254 (about 75%) have been labelled as "stable isotopes" – i.e. not subject to decay. An additional 34 radioactive elements have half-lives longer than 80 million years, and have also been in existence since the early Solar System (hence why they are called "primordial elements"). Finally, an additional 51 short-lived elements are known to occur naturally, as "daughter elements" (i.e. nuclear by-products) of the decay of other elements (such as radium from uranium). In addition, short-lived radioactive elements can be the result of natural energetic processes on Earth, such as cosmic ray bombardment (for example, carbon-14, which occurs in our atmosphere). The earliest known examples of atomic theory come from ancient Greece and India, where philosophers such as Democritus postulated that all matter was composed of tiny, indivisible and indestructible units. The term "atom" was coined in ancient Greece and gave rise to the school of thought known as "atomism". However, this theory was more of a philosophical concept than a scientific one. It was not until the 19th century that the theory of atoms became articulated as a scientific matter, with the first evidence-based experiments being conducted. For example, in the early 1800's, English scientist John Dalton used the concept of the atom to explain why chemical elements reacted in certain observable and predictable ways. Dalton began with the question of why elements reacted in ratios of small whole numbers, and concluded that these reactions occurred in whole number multiples of discrete units—in other words, atoms. Through a series of experiments involving gases, Dalton went on to developed what is known as Dalton's Atomic Theory, which remains one of the cornerstones of modern physics and chemistry. By the late 19th century, scientists began to theorize that the atom was made up of more than one fundamental unit. However, most scientists ventured that this unit would be the size of the smallest known atom – hydrogen. And then in 1897, through a series of experiments using cathode rays, physicist J.J. Thompson announced that he had discovered a unit that was 1000 times smaller and 1800 times lighter than a hydrogen atom. His experiments also showed that they were identical to particles given off by the photoelectric effect and by radioactive materials. Subsequent experiments revealed that this particle carried electric current through metal wires and negative electric charges within atoms. Hence why the particle – which was originally named a "corpuscle" – was later changed to "electron", after the particle George Johnstone Stoney's predicted in 1874. However, Thomson also postulated that electrons were distributed throughout the atom, which was a uniform sea of positive charge. This became known as the "plum pudding model", which would later be proven wrong. This took place in 1909, when physicists Hans Gieger and Ernest Marsden (under the direction of Ernest Rutherfod) conducted their experiment using metal foil and alpha particles. Consistent with Dalton's atomic model, they believed that the alpha particles would pass straight through the foil with little deflection. However, many of the particles were deflected at angles greater than 90°. To explain this, Rutherford proposed that the positive charge of the atom is concentrated in a tiny nucleus at the center. In 1913, physicist Niels Bohr proposed a model where electrons orbited the nucleus, but could only do so in a finite set of orbits. He also proposed that electrons could jump between orbits, but only in discrete changes of energy corresponding to the absorption or radiation of a photon. This not only refined Rutherford's proposed model, but also gave rise to the concept of a quantized atom, where matter behaved in discreet packets. The development of the mass spectrometer – which uses a magnet to bend the trajectory of a beam of ions – allowed the mass of atoms to be measured with increased accuracy. Chemist Francis William Aston used this instrument to show that isotopes had different masses. This in turn was followed up by physicist James Chadwick, who in 1932 proposed the neutron as a way of explaining the existence of isotopes. Throughout the early 20th century, the quantum nature of atoms was developed further. In 1922, German physicists Otto Stern and Walther Gerlach conducted an experiment where a beam of silver atoms was directed through a magnetic field, which was intended to split the beam between the direction of the atoms angular momentum (or spin). Known as the Stern–Gerlach Experiment, the results was that the beam split in two parts, depending on whether or not the spin of the atoms was oriented up or down. In 1926, physicist Erwin Schrodinger used the idea of particles behaving like waves to develop a mathematical model that described electrons as three-dimensional waveforms rather than mere particles. A consequence of using waveforms to describe particles is that it is mathematically impossible to obtain precise values for both the position and momentum of a particle at any given time. That same year, Werner Heisenberg formulated this problem and called it the "uncertainty principle". According to Heisenberg, for a given accurate measurement of position, one can only obtain a range of probable values for momentum, and vice versa. In the 1930s, physicists discovered nuclear fission, thanks to the experiments of Otto Hahn, Lise Meitner and Otto Frisch. Hahn's experiments involved directing neutrons onto uranium atoms in the hopes of creating a transuranium element. 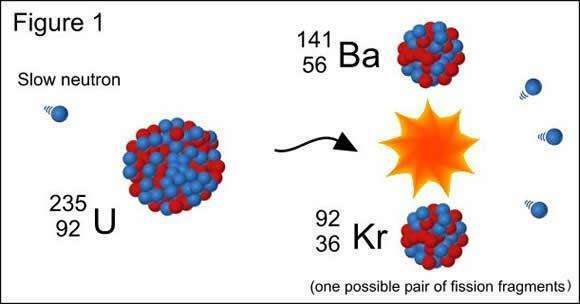 Instead, the process turned his sample of uranium-92 (Ur92) into two new elements – barium (B56) and krypton (Kr27). Meitner and Frisch verified the experiment and attributed it to the uranium atoms splitting to form two element with the same total atomic weight, a process which also released a considerable amount of energy by breaking the atomic bonds. In the years that followed, research into the possible weaponization of this process began (i.e. nuclear weapons) and led to the construction of the first atomic bombs in the US by 1945. In the 1950s, the development of improved particle accelerators and particle detectors allowed scientists to study the impacts of atoms moving at high energies. From this, the Standard Model of particle physics was developed, which has so far successfully explained the properties of the nucleus, the existence of theorized subatomic particles, and the forces that govern their interactions. Since the latter half of the 20th century, many new and exciting discoveries have been with regards to atomic theory and quantum mechanics. For example, in 2012, the long search for the Higgs Boson led to a breakthrough where researchers working at the European Organization for Nuclear Research (CERN) in Switzerland announced its discovery. In recent decades, a great deal of time and energy has been dedicated by physicists to the development of a unified field theory (aka. Grand Unifying Theory or Theory of Everything). In essence, since the Standard Model was first proposed, scientists have sought to understand how the four fundamental forces of the universe (gravity, strong and weak nuclear forces, and electromagnetism) work together. Whereas gravity can be understood using Einstein's theories of relativity, and nuclear forces and electromagnetism can be understood using quantum theory, neither theory can account for all four forces working together. Attempts to resolve this have led to a number of proposed theories over the years, ranging from String Theory to Loop Quantum Gravity. To date, none of these theories have led to a breakthrough. Our understanding of the atom has come a long way, from classical models that saw it as an inert solid that interacted with other atoms mechanically, to modern theories where atoms are composed of energetic particles that behave unpredictably. While it has taken several thousand years, our knowledge of the fundamental structure of all matter has advanced considerably. And yet, there remain many mysteries that are yet to be resolved. With time and continued efforts, we may finally unlock the last remaining secrets of the atom. Then again, it could very well be that any new discoveries we make will only give rise to more questions – and they could be even more confounding than the ones that came before!